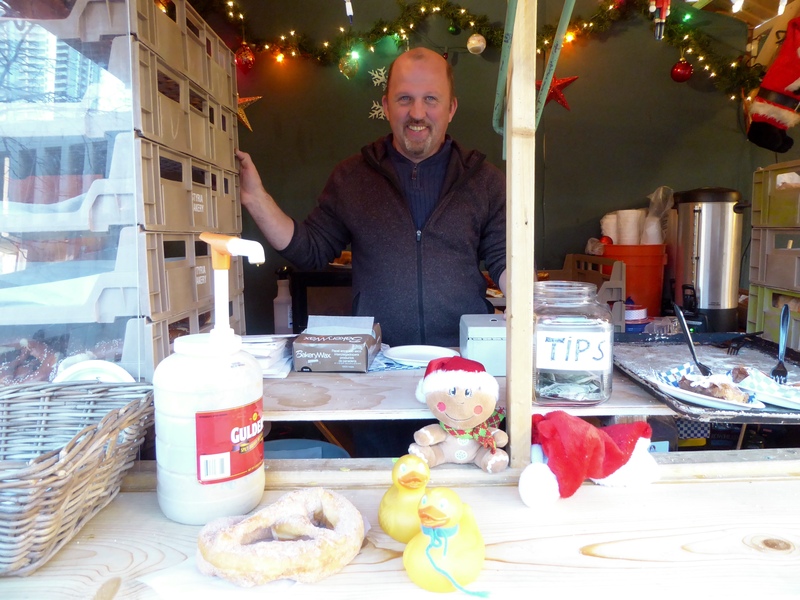 On a sunny Sunday, Zeb and Soapy Smith Duck wandered through Denver’s German Christmas Market. 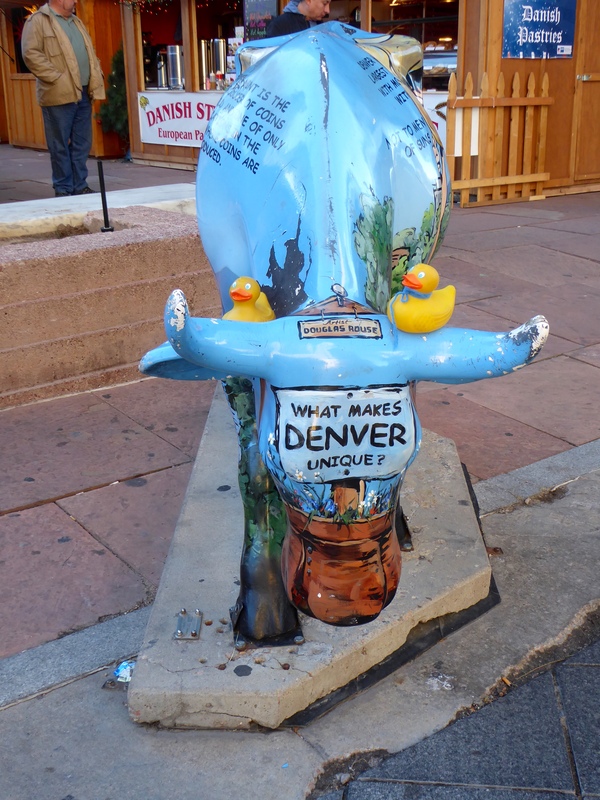 Walking down Denver’s Sixteenth Street Pedestrian Mall, heading toward Skyline Park, we stopped to read the blue cow by Douglas Rouse. We love the blue cow with some facts unique to Denver. Denver has the nation’s largest city park system with more than 200 parks within city limits. And we love the 300 days of sunshine each year to enjoy them. Our airport, Denver International, is the nation’s largest at 53 square miles. Did you know that the Denver Mint is the largest producer of coins in the world? And the thirteenth step of Colorado’s State Capitol Building is exactly 5,280 feet above sea level. We are the Mile High City. 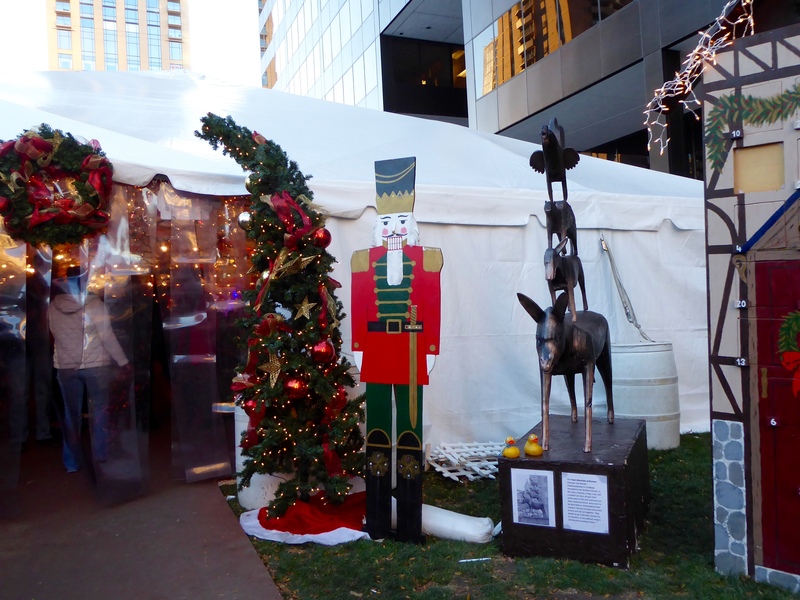 Let’s enter Denver’s Christkindl. There are so many venders with German or European themed items and food. We, Zeb and Soapy, want Soapy’s dog, Steve, to help us decorate this Christmas tree. 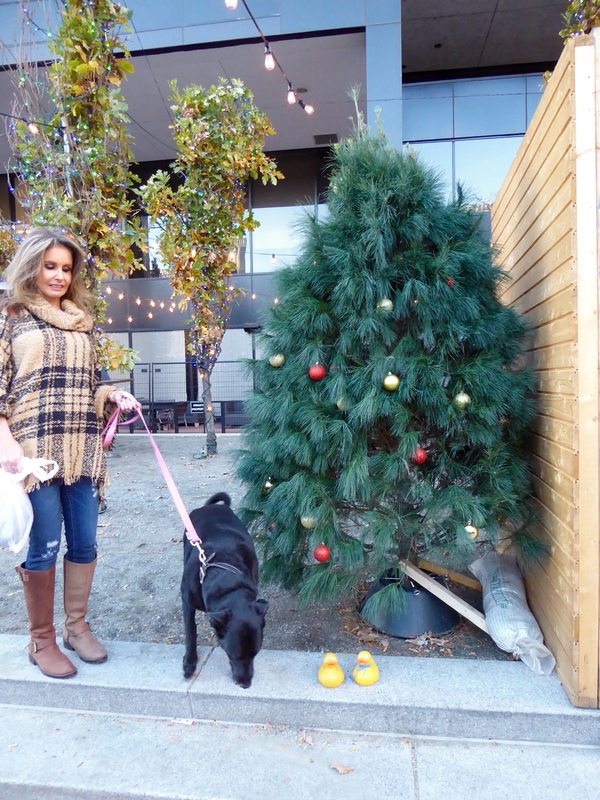 Remember our Soapy Smith Duck is quite the rascal, so Zeb and Steve will watch him so he does not take ornaments off the tree and give them to strangers. We love the top picture of a pier going over the water. 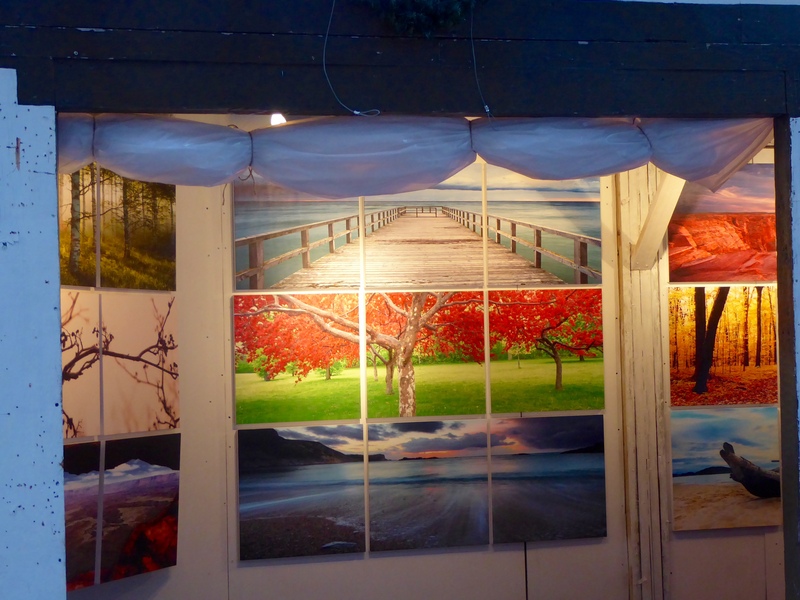 This booth had great art for sale. We were so tempted and had to try the potato pancakes, with applesauce. We really like them. Hand carved wooden decorations were a big hit. Aren’t they nice? 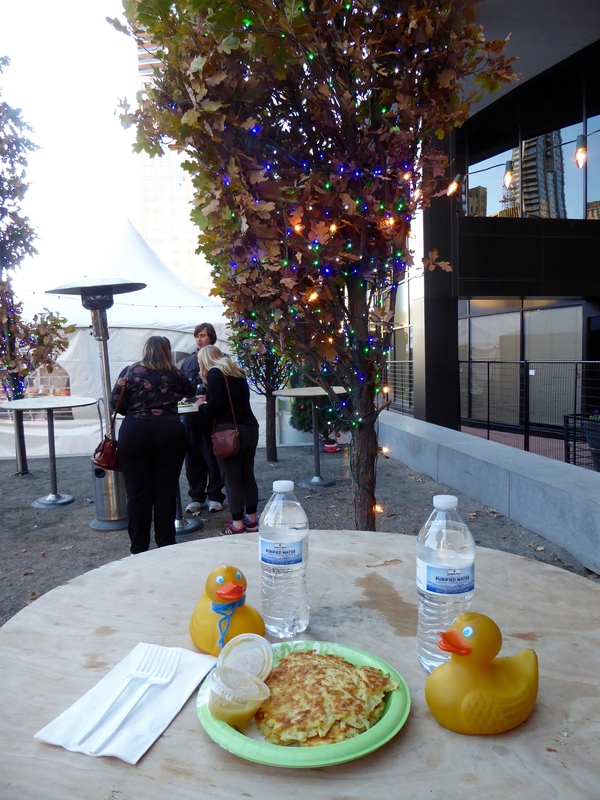 The potato pancakes were good, but we could still eat more. Then we saw the Styria Bakery. This huge pretzel with cinnamon and sugar was just what we wanted. Delicious! Here we are near the warming tent, which also happens to be the beer garden. By the entrance we saw and recognized this statue. 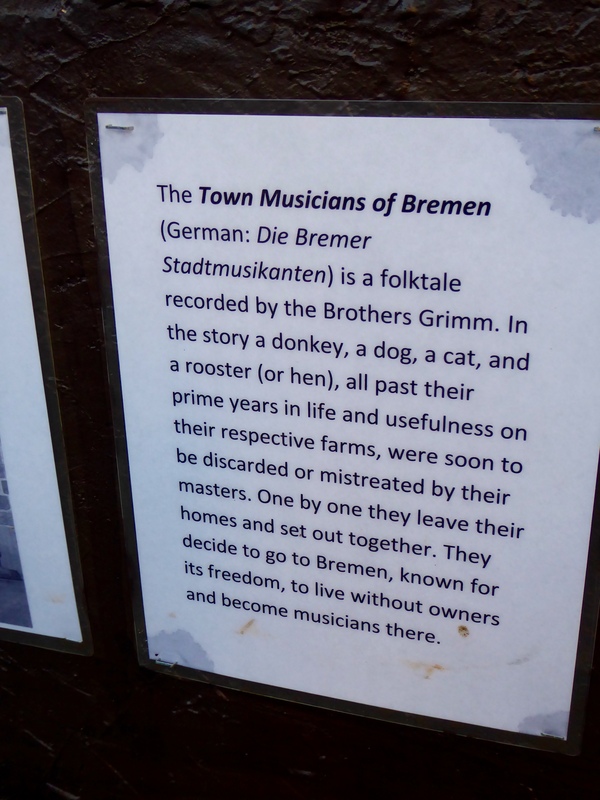 The Town Musicians of Bremen. 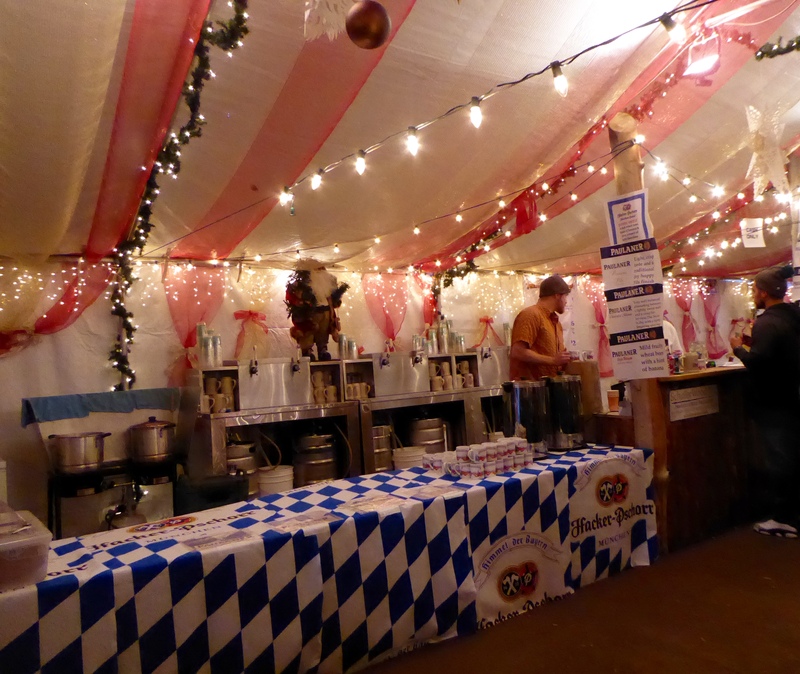 Inside the tent, people were enjoying the German beer. We spend a little more than one hour here, but it is great. 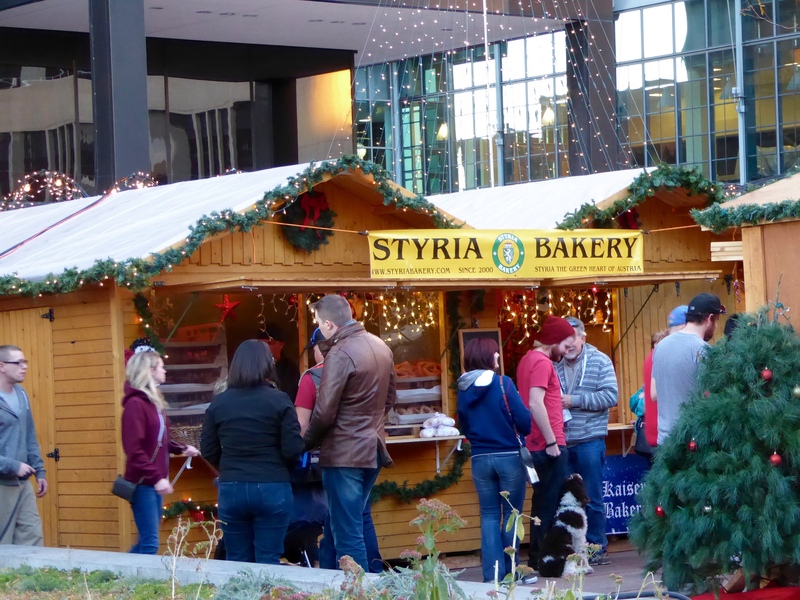 The Christkindl Market will be opened every day at 11:00 a.m. It will close at 1:00 p.m. on Thanksgiving. It usually closes at 7:00 p.m., but stays open until 9:00 p.m. Fridays and Saturdays. 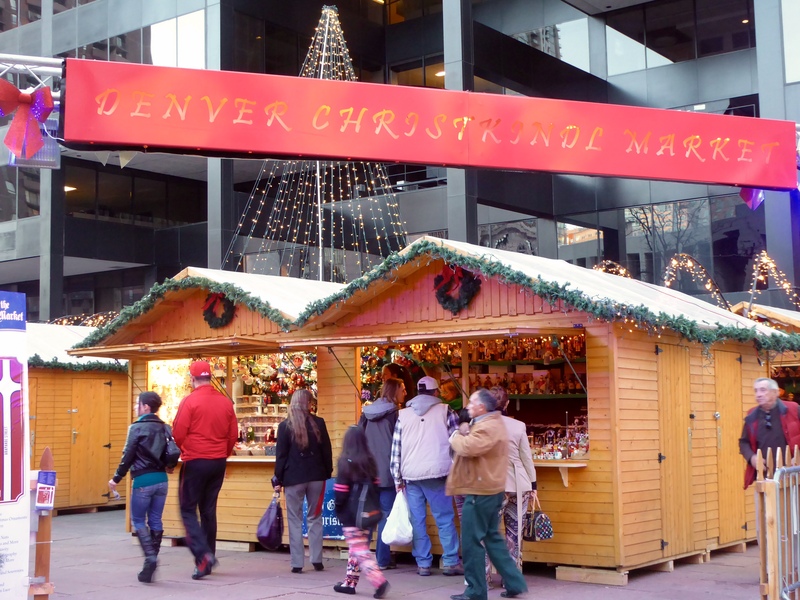 The market will be in Denver through December 23. We hope you will visit here on one of our many sunny days. We might even return again. This is a great place to purchase gifts, for others and for yourself. 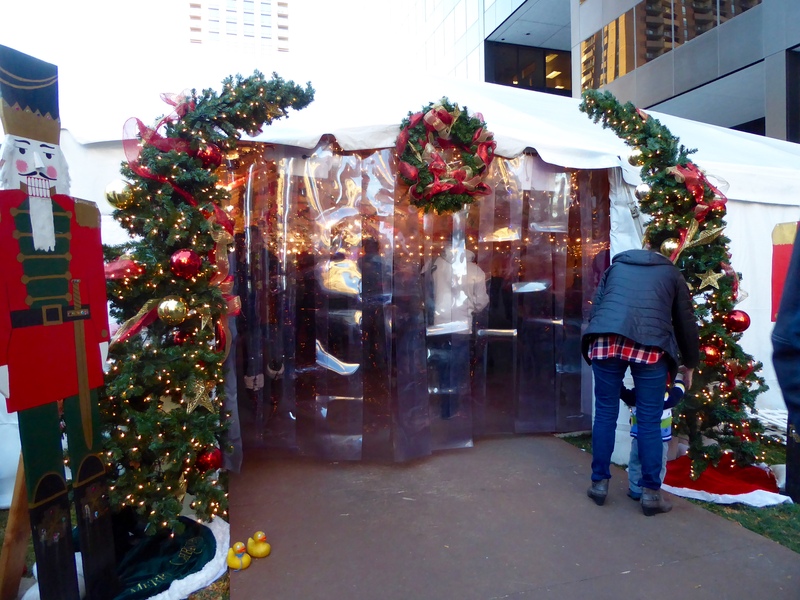 This entry was posted in Colorado, Holidays, Uncategorized and tagged blue cow, Christkindl Market, Colorado Traveling Ducks, Denver, German Christmas Market, potato pancakes, pretzel with cinnamon and sugar, Skyline Park, Styria Bakery. Bookmark the permalink. Most people see only Red Rocks, The Mint, and maybe a few more but you find such interesting and meaningful places in Denver and all of Colorado. I thoroughly enjoy your brilliant explanations and your knack for picture-taking. You make it real. Thank you for those kind words. We enjoy exploring Colorado. 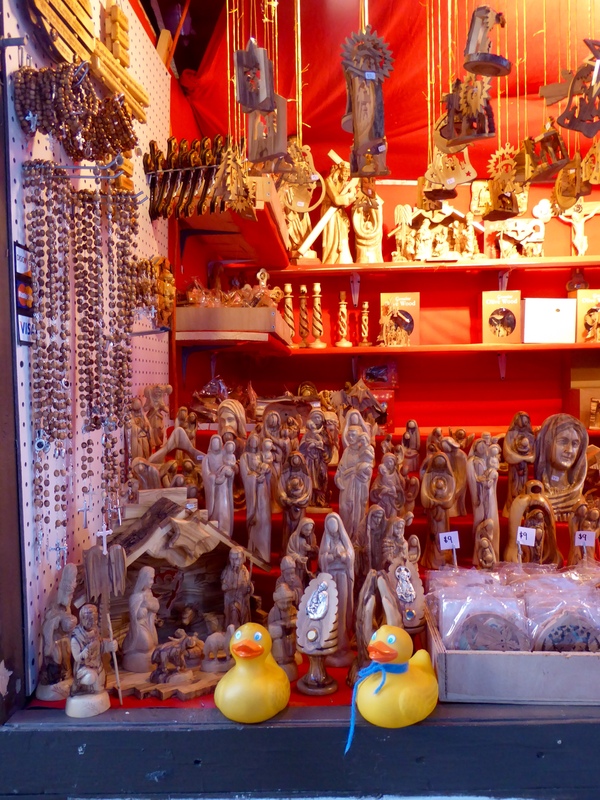 This German Christmas Market was fun and interesting and we had a warm day to explore it. Thanks for reading and commenting.